Copy audio files into your iTunes Podcast playlist. Is there a better alternative to Typecast? Is Typecast really the best app in Audio category? Will Typecast work good on macOS 10.13.4? 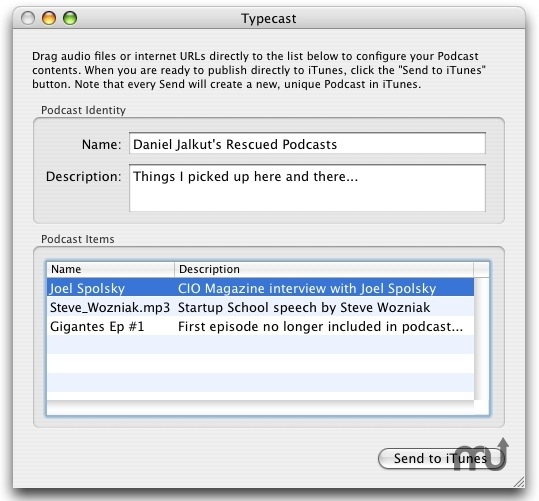 Typecast lets you copy regular audio files from your Mac or the Internet into the iTunes Podcast playlist. Version 1.0b2: Native support for Intel Macs. Typecast needs a review. Be the first to review this app and get the discussion started! Typecast needs a rating. Be the first to rate this app and get the discussion started!